It’s winter - a slippery and muddy time for ultrarunning. The days are short. You may welcome these changes as an excuse to slack off on your training, when in fact this is the time of year to increase your training volume, especially if you aspire to run ultras. Why such a heavy emphasis on aerobic training in the off-season? This is when the ultra runner needs to further develop his maximal oxygen uptake, improve economy of movement, improve cardiac output, increase blood volume, increase the capillary network that feeds the muscles, and increase the volume of glycolytic and oxidative enzymes in his muscles—the very essence of aerobic activities. Lay your ultrarunning foundation with three types of training: long, steady aerobic running, hill running and strength training. When meshed, the trio will make you a much stronger trail runner, but it takes time so don’t dally during the holiday season. Brian Morrison, 32, of Seattle, Washington, maintains a consistent winter aerobic base while allowing a break mentally and physically before his higher intensity ultrarunning spring training. 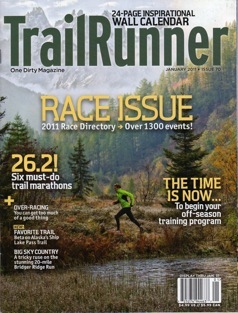 Says Morrison, a second-place finisher at the White River 50 Mile National Championship and near winner of the Western States 100-miler in 2006 (in the lead, he collapsed several times in the last 300 meters and was helped up, resulting in a DQ), “Winter base building is absolutely critical to racing well through the spring and summer. You’ve got to have a solid foundation from which to build up from. Winter base miles help prep your body for the more taxing mileage that is sure to follow in the build up to race season”. Adam Lint, 27, of Seattle, Washington, puts in 100 to 120 miles per week during his winter conditioning phase. In 2008, his approach has paid off with a third-place finish in the USA 100K Road Championship and a second in the White River 50-mile trail championship. “Ultrarunning is a year long sport, that is one of the things I love about it, even when resting it is important to stay active. In 2008 I cross trained in the pool and in the gym on my easy days and also during recovery weeks after events”, says Lint. Getting your body used to slogging for long periods is the main requirement for ultrarunning. Your focus should be on running slower than in the racing season, and going for higher volume, to maximize your aerobic conditioning, train your slow- and fast-twitch muscle fibers for long cruising, while learning to burn carbohydrate and fats more as fuel. This endurance base enables you to mix speed running into your schedules later on, when you enter the racing season. Lengthening your long runs is the most efficient way to do this, a typical ultrarunning training schedule contains at least one long run per week, and adding one or two medium distance runs (see sidebar). Develop your conditioning by gradually increasing your weekly mileage for eight to 10 weeks to build a solid aerobic base. Brian Morrison advises, “The key to winter base building is to keep it pretty easy. It's way too easy to run overly hard in the winter and come out feeling flat and overtrained by spring. For me, I try to do one day a week of flat tempo running from 3-6 miles, while the rest of the week is very easy running”. The second phase entails building strength, with a four- to six-week cycle including hill running. Why so important for ultrarunning? The ultra runner who does not emphasize hill running during his conditioning phase will pay the price in the racing season—the ultra runner’s ability to deal with hills will make or break him in a race. Hill training improves lactate tolerance, leg strength, increases your stride length and frequency on the flat, drives your VO2 max sky high, and further improves your running economy—and perhaps most important for ultrarunning, gives them confidence when they are facing a daunting uphill slog in the middle of their race. Brian Morrison says, “Hill training is a very important component of training for ultras. It becomes exponentially more important the hillier the course is that you are training for. You want to feel strong and at ease going uphill, but don't forget the importance of running downhill as well. When I'm in peak training mode, I’ll run two ascents up a four mile climb at threshold heart rate, and there is tremendous benefit to getting strong on the uphills. However, I find as much benefit to running the four mile descent hard too. These long descents will really build up your quad strength. Adam Lint is a big fan of hill training, “Hill repeats allow me to get in quality fitness work without the pounding on the flats or downhill's. I do everything from short 1-5 min hill repeats on a gradual grade to 4 mile repeats with lots of elevation gain. I believe they help me stay injury free while allowing me to get in the necessary training to compete well”. Your weekly ultrarunning schedule should include a minimum of one long run of 1.5 to 2.5 hours or longer. This is your conditioning bedrock. You’ll also need one medium-distance run of 1.2 to 1.5 hours; and three or four shorter recovery runs or cross-training workouts of 30 to 45 minutes each. Every third or fourth week, cut back your running by 30 to 40 percent for a recovery week. The key to your ultrarunning conditioning is to find out how many long runs you can handle, and work within that. Some runners adapt easily to 2 or 3 long runs each week, while others struggle to do just one. Adam Lint clearly belongs in the former category, running up to four long runs per week and it’s not unusual for him to do a 50-miler for his long run. Brian Morrison averages 50-60 miles each week during his winter conditioning, including one long run of 14 to 16 miles. Both Morrison and Lint hit the trails two times each week throughout the winter. Exercise scientists no longer believe that running alone is adequate for ultrarunning. Research shows that resistance training improves fast twitch muscle fibers (which come into play during the latter stages of ultrarunning and while running uphill), improve neuromuscular coordination and balance, give better resistance to muscular fatigue, and reduce risk of injury. By training your muscles to deliver more force, or power, with each stride, the larger the range (or reserve) will be between your cruising and maximal efforts when trail running. This translates into cruising at a lower percentage of your maximum effort for a longer time. Strength training is best done concurrently with your aerobic running and hill running phases. The strength-training program below focuses on the major ultrarunning muscle groups; the legs, buttocks, back, core, shoulders and arms. Strength training is most effectively done two to three days a week, with at least one rest day between each session. If you are very fatigued and sore after each workout, split it into two workouts, and allow two days rest between each one. Start with one set of eight to 12 repetitions of each exercise. If you adjust comfortably, increase the number of sets per exercise to two. It’s really not necessary to do three sets of each exercise, as the research shows that strength gains for single versus multiple sets are similar. There are 16 exercises in this program, so one or two sets of each is all you need to do. Remember, weight training is an adjunct to your ultrarunning schedule, and not the prime reason you are training. Plus, doing a heavy weight training schedule with multiple sets of each exercise is likely to increase your upper body muscle mass—something that impedes ultrarunning because of the extra weight. Adjust back pad for comfort. Lean back on machine with back firmly against pad. With legs shoulder width apart, and ankles, knees and hips aligned, slowly straighten legs. Do not lock out your knees. Press heels against the platform through full range. Stand upright with feet together, holding two dumbbells at your sides in overhand grip. Slowly take a large step forward with one leg, bending both knees. Your rear knee should come close to the floor. Using your extended leg, push yourself back to the starting position, reversing the movement. Advanced lunge: keep moving forward with each step, instead of returning to your original standing position. Adjust seat so knees are aligned with axis of the machine. Lean back against pad, extend legs straight out to full extension, and slowly return. Lie face down on bench with knee joints aligned with the axis of the machine. Adjust leg pad so that it is on lower part of calf. Hold handles securely and flex knees as far back as comfortable. Return slowly to straight leg position. Using calf raise machine, place shoulders under pad and raise up on toes, then slowly lower back so your calf muscles are stretched. Tie one end of 3 feet length of tubing on a table leg and place left foot through loop at other end. With left side facing table, stand on right foot and draw left foot towards your body midline, with straight legs. Slowly let foot move back to starting position. Reverse legs to work right leg. This can also be done on a seated Nautilus Adduction machine. Tie one end of 3 feet length of tubing on a table leg and place right foot through loop at other end. With left side facing table, stand on left foot and draw right foot away from your body midline as far as possible from your right side, with straight legs. Slowly let right foot move back to starting position at midline. Reverse legs to work left leg. This can also be done on a seated Nautilus Abduction machine. Place 2” wide rubber mini-band around ankles. Choose light, medium or heavy band that enables you to complete this exercise. This is a “sideways shuffle” exercise. Walk sideways by extending one foot out sideways, then let other foot move in towards it. Move 20 side paces to your left then to your right. Tie one end of 3 feet length of tubing on a table leg and place right foot through loop at other end. With back to table, stand on left foot and draw right knee forward until thigh is parallel with floor. Slowly let right foot move back to starting position on floor. Make sure you exercise both legs. Adjust back extension machine so you can fully flex your torso below it. With hands crossed in front of your chest, slowly straighten your back while breathing out. Straighten back to 180 degrees, then slowly lower torso while breathing out. Standard sit-ups also strengthen your hip flexor muscles, a group that is used extensively during trail running. When you can do 20 sit-ups on a horizontal level, add 5 lbs weight to your chest. Plant feet firmly on floor, buttocks, head and shoulders on bench. Grip dumbbells so that your hands are above your elbows to start. Pull shoulder blades together and hold them there, while lowering arms so that upper arms are parallel with floor. Do not lower any further than this. Push arms straight up, above elbows, and then pull dumbbells in together. Reverse this action slowly and repeat. Plant feet firmly against the foot platform, legs slightly bent, and trunk vertically straight at 90 degrees to the bench. Place pulley handle on the cable socket. Grip handles, with wrists facing downwards or inwards depending on your handle. With elbows facing downwards or outwards, slowly pull the handle straight back towards your stomach. Keep your shoulder blades squeezed together through this action. Slowly return to start position without bending forward. Stand with legs shoulder width apart, knees slightly bent. Tuck elbows in to sides, and aligned under shoulders. With dumbbells in hand, forearms facing forward, slowly contract biceps and pull dumbbells up as far as they will go. Slowly return to starting position. Sit on bench with bench back pulled up to support your back. Feet flat on floor and a dumbbell in each hand, out to your sides. Push dumbbells directly up over your elbows, and pull them in towards each other. Slowly lower dumbbells so that your upper arms are parallel to the floor, and raise again. Stand facing cable machine with legs shoulder width apart, knees slightly bent. Adjust cable so that it is at highest setting. Set a curved triceps bar, about 18 inches long, on cable. Grip curved bar with hands sloping downwards to the sides. Slowly push bar downwards to full arm extension. Slowly return to start position.